Roberts Hawaii now provides the opportunity for out-of-towners to visit those quiet places and real people who live upcountry on Maui and on the back roads of Oahu to taste the foods they grow and experience their aloha. One Roberts Hawaii Upcountry Maui tour visits the Ali'i Kula lavender farm. Visitors sip lavender teas and eat scones next to the farmhouse and then wander among the acres of 25,000 lavender plants with the serenity of the beautiful Pacific as a backdrop. Roberts also offers the Back Roads of Upcountry Maui tour. In addition to the lavender farm visit, the tour also travels to the Surfing Goat Dairy to meet owner Thomas Kafsack and the band of goats that provide him the milk to make 25 different goat cheeses. Then, it's on to the Tedeschi Vineyards, Maui's only commercial vineyard, at Ulupalakua Ranch nestled at 2,000 feet upslope on Haleakala. 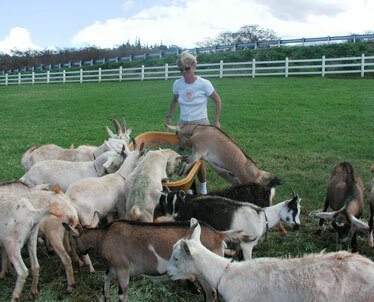 Roberts Hawaii is providing tours to the back roads of Upcountry Maui, including visits to the Surfing Goat Diary to meet owner Thomas Kafsack and the band of goats that provide him the milk to make 25 varieties of goat cheese. For those who want to witness sunrise on Haleakala, Roberts Hawaii offers a comfortable, safe and relaxing alternative to driving. Not only does Roberts Hawaii do the driving, but there is also a stop for a country breakfast at the Surfing Goat Dairy on the way back down the mountain. Maui tours begin in Kahului, but pickup arrangements can be made from Kaanapali, Wailea and Napili hotels. The Back Roads on Oahu tour stops at farms and plantations to sample pineapple, apple bananas, papayas, greens and macadamia nuts grown there and featured at the best restaurants in the islands. Included is a lunch stop at Kahuku farms where visitors dine on ingredients fresh from the countryside. The tour also explores Waikane Tropical Farm, Helemano Plantation and more. Roberts Hawaii has served the islands for more than 65 years and has become one of Hawaii's largest privately owned tour and transportation companies, with a fleet of more than 1,000 vehicles. Visit www.robertshawaii.com for more information.